The President met with council members from South Huvadhu Atoll Vadhooo, this afternoon at the President’s Office, and discussed various concerns raised by the residents. The Councilors spoke with regard to the need for better waste management; the impediments to agricultural activity due to an increasing amount of pests; increased flooding; and the preservation of certain places located on Vaadhoo, due to them being of historical and cultural significance. 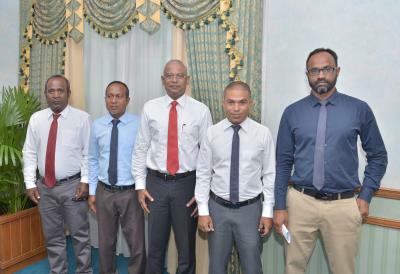 The President gave the Councillors his personal assurance that he would take all the concerns expressed into positive consideration and that he would instruct the relevant ministries to coordinate on ways to ensure that the issues raised by the residents of Vaadhoo can be addressed. He reiterated his frequent message that infrastructural development should reach across the entire country, and he further highlighted that his administration is committed to supporting Maldivian farmers, and ensuring the country’s food sufficiency.